Join us as we celebrate art and autumn with a musical concert and art show! Watch the 1st Songs to Recovery showcase on Rogers TV here! Walking Across Canada "Walk Where You Are"
Different from many of the mainstream treatment models, EFFT is rooted in the deep belief in the healing power of families across the lifespan. EFFT is a very powerful mode of therapy - parents and caregivers are taught practical skills and techniques that can be used to support their loved one's recovery regardless of his or her age and/or motivation for change. Parents and caregivers are also supported to work through their own fears and emotional reactions that will no doubt arise throughout the challenging road toward recovery and wellness. *An official receipt in the full amount of $450 for psychological services will be provided by Dr. Dolhanty and Dr. Robinson for extended health benefit coverage with your provider, if applicable. Wednesday, February 2rd, 1:00-4:00 p.m.
Join us at 15213 Yonge St., Suite 15 (on the second floor, accessed by stairs by the front of the building) to enjoy our relaxing art gallery and living room space while browsing lovely artwork, and find out about the various programs we offer! You may leave your message of hope, inspiring positive affirmations over negative self-talk on our giant "sign of support" - an art installation shared on our art blog. You may wish to to Riverwalk, or the Eating Disorder Foundation of Newfoundland and Labrador. If you would like to donate to Riverwalk, Donate online or, send us your pledges! If you would like to donate to EDFNL, visit their website for details. Download the pledge form here. Tax receipts will be issued for donations over $10. Twitter handle @EDOYR to join the walk! Use #WalkWithRiverwalk when posting your photos of support! Riverwalk Wellness Centres Celebrates and Inspires! Participate in creating a giant message of hope inspiring positive affirmations over negative self-talk. Write a message and your "sign of support" will be shared on our art blog. We will host a coffee-house style open mic event in our gallery during our first-ever Open Mic (No Mic) Cafe! Bring a song, a poem, a story, visual art or anything else that you'd like to share. Performers and non-performers are warmly welcome Coffee, tea, and refreshments will be served,however, this will be a no-food environment. Bring your family and friends and enjoy the afternoon as we celebrate the arts and community and their role in social, mental, emotional, and spiritual wellness. Scroll down to view the video "Music as Expression"
The Auroran Songs to Recovery article. Celebrate spring and renewal with friends and family. Enjoy a musical concert and an art show. and Funk band. New and returning solo artists will also perform! Saturday, March 14th, 2015, 2:00-4:30 p.m. Doors open 1:30 p.m.
Tickets are $10 and can be purchased online below or at the door. FREE: All are welcome - registration is required. Email info@edoyr.com or register online. - Screening the Riverwalk film "Self Destructing to Survive"
- Learn how to access support and how to create a "Circle of Care"
Join us in discussion regarding eating disorder support and recovery with members of the "Faces of Recovery" campaign who will share their strategies for maintaining wellness and open the floor for questions and conversation. Feel free to bring a support person or to be a support person for someone on the journey of recovery. Listen to reps from 4 pillars of community drug strategy – Treatment, Prevention, Enforcement and Harm Reduction. Also hear from family members impacted and people with LIVED experience. Presentations by Youth and Spoken Word performances. Major Annual Fundraising Event "Annie!" Friday, November 21st at 8:00 p.m. Doors open at 7:30 p.m. for the silent auction and art show! Join Steppin' Out Theatrical Productions in supporting an important cause! Steppin' Out Theatrical Productions continues to generously support Riverwalk Wellness Centres as they have for seven consecutive years!. This year, Steppin' Out will donate all ticket sales for the November 21st evening performance, purchased directly through Riverwalk Wellness Centres, will benefit Riverwalk Wellness Centres support programs. Please contact us at info@edoyr.com if you would like information about supporting our silent auction with the donation of gift certificates. Tax receipts are issued as per Canada Revenue Agency Guidelines. Please review the silent auction merchandise contract for more information. 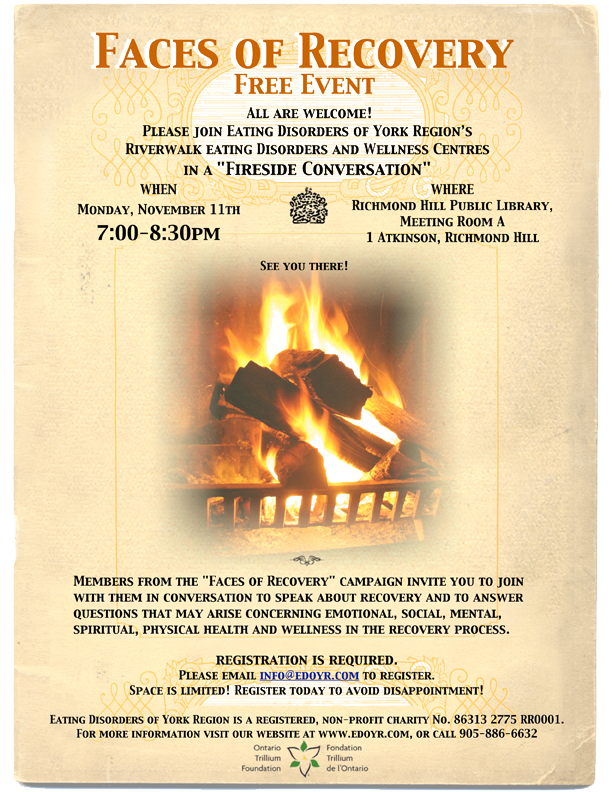 Please join Eating Disorders of York Region’s Riverwalk Wellness Centres in conversation about recovery; bring your questions concerning emotional, social, mental, spiritual, physical health and wellness in the recovery process. As part of Culture Days, Eating Disorders of York Region's Riverwalk Wellness Centres is hosting an open house in our Art Gallery. During the open house we will be screening "Self-Destructing to Survive", a short film in which six individuals from different walks of life share their stories of struggle, revelation, and recovery regarding substance use, disordered eating, anxiety and depression, and other mental health concerns. For more about Culture Days and to view our event online, visit the official website. Slideshow for last year's walk: Free, fun for the whole family! The Auroran Article: Walk to Raise Awareness for Eating Disorders. Download the Registration/Waiver Form here! How did you find out about the walk? Thank you for registering for the "Walking Across Canada" Remembering Renata Walk on August 24th in Newmarket! 100 in 1 Day: "Show Your True Colours!" FREE event at the Richmond Hill Public Library, 7:00-8:30 p.m. To register, please email info@edoyr.com. Space is limited! Register early to avoid disappointment.